There is a high mountain pass in the southwestern corner of Colorado known as the Dallas Divide. It is a saddle between the San Juan Mountains to the south and the Uncompahgre Plateau to the north, with its tallest peak being 8,983 feet above sea level. Dallas Divide provides amazing and breathtaking scenic views, especially in its full autumn glory. Colorado's Rocky Mountains posed a formidable obstacle for early explorers and pioneers, but in spite of that, this rugged pass became an important passageway through the treacherous Rockies. In 1880, a toll road was constructed, and a mere decade later, the Rio Grande Southern Railroad was built through the pass, linking the town of Dallas, near Ridgeway, with Telluride by road and rail. 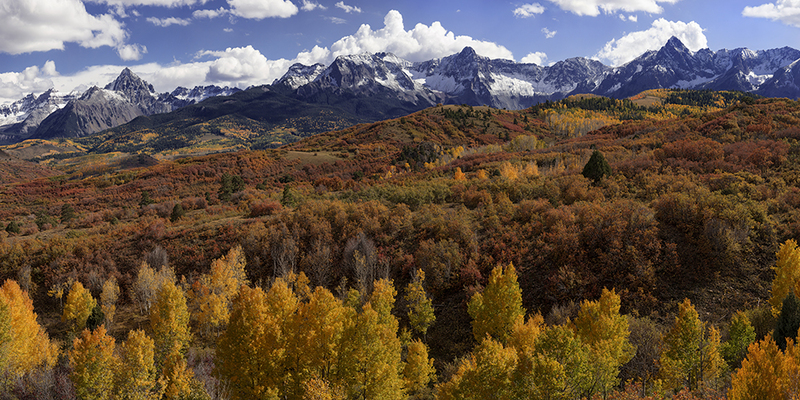 This photograph is a panoramic vista of the historic Dallas Divide at absolute peak of its fall colors. The beautiful autumn foliage carpets the foothills of the majestic peaks of this portion of the Rocky mountains. The glowing mantle of rich yellows, deep oranges and flaming reds bring this expansive scene to vibrant life.